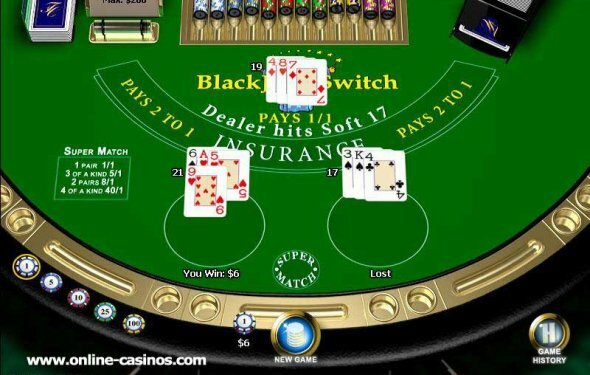 Blackjack Switch is a variation of standard blackjack that takes just a few minutes to learn. Of course if you already know how to play blackjack, that's a plus. Like regular blackjack, Blackjack Switch is played with a standard 52-card English deck. There are no bonus cards or jokers used. This is a fun variation of standard blackjack. In blackjack switch, each player is required to make a bet on each of two hands. The dealer will then deliver two face-up cards to each betting circle and two cards to themselves. One of the dealer's cards will be exposed. Now the fun begins. At this point the player is allowed to switch their second card on the first hand with the second card on their second hand. For example, if the player is dealt a hard 15 and hard 16 as in the photo above, then the player would switch the ten for the five and make two hands, a 20 and an 11. The super match is a side (bonus) bet that pays even money when a player's first two cards are a pair. Three of a kind pays 5 to 1 and two pairs pay 8 to 1. If the player is lucky enough to get four of a kind, the payoff is 40 to 1. Yes, there are a few things you'll want to consider before playing Blackjack Switch. Since you are in control of your hands, know that you'll want to balance your hands on occasion, while other times it is better to make one very strong hand. With that in mind, you obviously want to make one of your hands a 21, that's best, but what about other hands? If the best hand is 21, 20 and 19 follow. Next, a pair of aces are better than 11, 10 or 9. All of these hands are better than an 18 or lower hand, so try for these first. If the dealer is showing a 7 or 8, there's a good chance they have a 10 underneath, so two hands of 17 or 18 is better than one hand of 19 and a hand you have to hit, such as 16. Just Win! Slot Machine and Giveaway! Prevents scratches, chips and dirt from accumulating. Perfect cutouts allow you to maximize the functionality of your phone. High quality durable and beautiful. Images printed on cases are high-resolution and do not peel or fade. Easy Access to All Controls & Features of the Device Without Having to Remove the Case.